The only recipe for Fried Polenta with Scamorza Cheese you'll ever need or ever want. Don't believe me? Try it and you'll be convinced! Like all the best recipes in Italy this one comes from the mamma and nonna of a friend. Many times the mammas and nonnas of Italy guard their "secret" recipes fiercely. Insist a little too much that they let you in on the secret and you may well find yourself being chased out of the kitchen by the mamma or nonna in question. Believe me you don't want to argue with an Italian mamma who has a wooden spoon in her hand! Luckily, we do all the suffering for you. We've been chased out of kitchens, suffered regularly under the wooden spoon... and all so that you can have these original recipes. 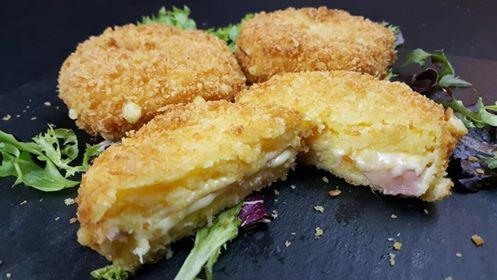 Now that you know what we go through I hope you'll enjoy this recipe for fried polenta with scamorza cheese and prosciutto cotto - otherwise know as Polenta Cordon Bleu. Heat the water, as soon as it begins to boil add a bit of salt and some olive oil. Pour in the polenta and start to stir it with a whisk, than keep mixing it with a wooden spoon. When the polenta gets thick, transfer it into a lightly greased tray and level it with a spatula to obtain a polenta of about 1cm thick. Cover with wrapping foil and let cool in the refrigerator for about 30 minutes to make it firmer. Remove from the refrigerator and use a glass to cut 6 polenta discs from it (make sure to not waste the remaining polenta!) Using the same glass, cut 6 scamorza cheese slices into discs and place them on top of 3 polenta discs. Cut the ham in the same way and place it on top of the cheese, then add another 3 scamorza discs followed by the remaining 3 polenta disks. Roll it it into the bread crumbs, paying special attention to the outer edges. Repeat the rolling in eggs+breadcrumbs. Heat the sunflower oil in a rather deep pan and when it has reached around 160 °C/ 320 °F, dunk in one polenta disc (polenta cordon bleu).